That’s just the start. President Trump signed the new and improved trade deal between the US, Mexico and Canada. Later that morning, he met with Japanese Prime Minister Abe and Indian Prime Minister Modi. That sent a strong signal to China that South Korea, Japan and India have sided with the US, not with China. In terms of strategic importance, this development can’t be emphasized enough. China is already buckling during these tariff fights. BTW, the Dow finished up almost 288 points today. They certainly liked what they heard from the G20. To be sure, there’s some noise coming from the Mueller witch hunt but that’s just noise. It isn’t anything that the American people take seriously. That being said, I don’t doubt that Mueller will weave together a document that Democrats will pounce on. They don’t have a choice on that. That being said, it’s difficult taking him seriously. Trade negotiations between the U.S. and China will yield immediate results that will come even during the 90-day negotiation period ahead, National Economic Council Director Larry Kudlow said Monday. Tariffs on agriculture and energy products will be lowered while nontariff barriers on American ownership of companies in China also will come down, Kudlow told the Fox Business Network. In addition, Kudlow expects progress on technology transfers and intellectual property. If anyone wondered whether President Trump would stick the proverbial shiv into Comrade Putin’s vitals, those doubts should disappear immediately. That isn’t granting absolution for his terrible performance at the press conference heard round the world. It’s now possible to think that President Trump missed an opportunity at that press conference and that he just hurt Russia, aka Putin, badly. Thanks to the preliminary trade agreement President Trump made with the EU, the Kremlin will have far fewer rubles to count in the near future. Everyone knows that what little strength the Russian economy has comes from the exporting of their energy resources, especially to eastern European nations. The trade deal that President Trump just negotiated with the EU includes expanded trade of liquefied natural gas along with other energy products. Does anyone think that Putin is sitting in his Kremlin office thinking about how grateful he is to President Trump? That’s right. He isn’t thinking that whatsoever. He’s seeing red — and not the red usually associated with the Soviet Union. It’s now time for President Trump’s critic — and they are legion — to admit that he’s got the economy growing while the economic storm clouds disappear from sight. The doom and gloom predicted by MSNBC, CNN, the NY Times and other parts of the Democrats’ messaging apparatus won’t happen anytime soon. Happy days are here again. That being said, when European Union chief Jean-Claude Juncker said “This is also a message to others”, everyone immediately knew he might as well have been talking directly at Putin. This point can’t be overemphasized. The other people whose crest has fallen since the agreement was reached are the Democrats. Thanks to yesterday’s agreement in principle, there won’t be a recession (or even a slowdown) right before the election. Further, the Democrats have started questioning whether people are feeling like the recovery is real. The blue collar workers building pipelines think it’s real. The people opening up new LNG wells think the Trump recovery is real. Everywhere you look, people are thanking President Trump for putting in place the policies that’ve caused their 401(k)s to grow and their benefits to improve. This was a silly question from the start. If people thought that the Trump recovery wasn’t real, why is consumer confidence sky-high? Now, thanks to this agreement, farmers will get the relief they need. Predictably, President Trump’s critics are out in force today. On the Senate floor, Senate Minority Leader Chuck Schumer focused on the Democrats’ talking points, saying that meeting with KJU gave him legitimacy that KJU will turn into favorable treatment from the community of nations. Saying that Sen. Schumer’s logic is more than flawed is understatement. Further, if you accept Sen. Schumer’s logic as Gospel fact, then war or a nuclear North Korea is inevitable. That’s the definition of Democratic defeatism. We just had 8 years of that. The international community is worse off as a result of President Obama’s mishandling of foreign policy/national security. The prestige that Kim Jung-Un supposedly got from the Summit can disappear in an instant. If Democrats are worried about that, they aren’t paying attention to what’s important. Despite the TV media’s obsession with what didn’t happen, they should consider the Trump administration’s strong negotiating position. The military option is still a legitimate option. The UN sanctions haven’t been lifted. President Trump, Secretary Pompeo, Ambassador Haley and NSA Bolton have made it perfectly clear that the sanctions won’t get lifted until they see North Korea’s actions change. Further, if North Korea insists on continuing playing games, they can pay the price for that decision. That’s before taking seriously the reality that President Trump won’t hesitate to use the military option if it comes to that. I remember Ambassador Crocker’s reply when asked what he thought of the Nimitz carrier group. He replied “That’s what 20,000 tons of diplomacy looks like. TRANSLATION: Little Rocket Man, the era of strategic patience is history. 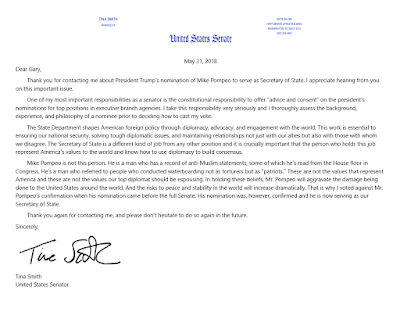 Right before Mike Pompeo’s confirmation vote to be Secretary of State, I wrote a letter to my senator, Tina Smith. 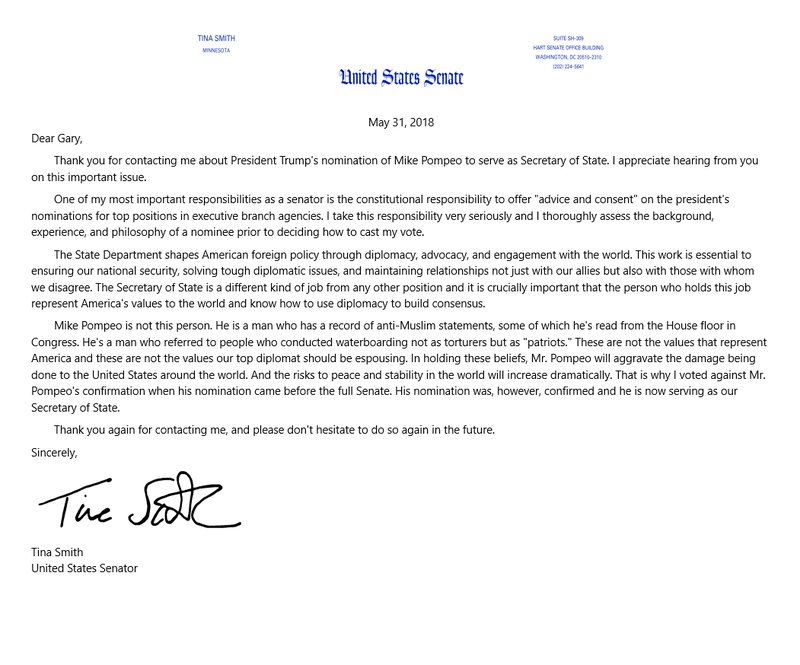 This afternoon, Sen. Smith’s letter finally arrived. Let’s remember that Secretary Pompeo was confirmed on April 26. Tina Smith’s arrived on May 30. It’s about 1:15 into the video. How will U.S. foreign policy ever recover from such behavior? Seriously, this question must be asked. What the hell is Tina Smith yapping about? What she said is utter rubbish. Let’s speak plainly about this. Tina Smith is a partisan hack who isn’t qualified to be a U.S. senator. What type of competent U.S. senator thinks that doing everything legal to prevent a terrorist attack isn’t a patriot? What type of honest politician thinks that U.S. foreign policy is heading in the wrong direction? Again, I ask Sen. Smith this simple question: what the hell are you talking about? Rather than wait for another letter from her, I have a better idea. Let’s fire her and elect someone who’s actually qualified. After President Trump officially announced that he was pulling out of the JCPOA, President Obama criticized him, saying “today’s announcement is … misguided. Walking away from the JCPOA turns our back on America’s closest allies, and an agreement that our country’s leading diplomats, scientists, and intelligence professionals.” Actually, the JCPOA wasn’t negotiated by “our country’s leading diplomats, scientists, and intelligence professionals.” It was negotiated by dimwits like John Kerry, John Brennan and Susan Rice. I’d hardly call them the best and brightest of our diplomats. I’d call them the Three Stooges. Included in President Obama criticism was the statement that “First, the JCPOA was not just an agreement between my Administration and the Iranian government. After years of building an international coalition that could impose crippling sanctions on Iran, we reached the JCPOA together with the United Kingdom, France, Germany, the European Union, Russia, China, and Iran. It is a multilateral arms control deal, unanimously endorsed by a United Nations Security Council Resolution.” That’s precisely what it was. It wasn’t a treaty ratified by the Senate. If it had been a negotiated treaty, it would’ve been subjected to a humiliating bipartisan rejection of President Obama’s national security policy towards Iran. Again, this wasn’t US agreement. That status is only conferred with treaty ratification. Without the Senate’s advice and consent, the agreement is nothing except an agreement between an idiot masquerading as a commander-in-chief and a room full of Islamic theocrats. Further, President Trump’s decision instructs the world’s despots that he won’t tolerate wink-and-a-nod deals that don’t protect the American people. Like Charles Krauthammer once said, “it isn’t that there’s a new sheriff in town. It’s that there’s a sheriff in town.” President Trump’s official announcement sends the strong message that he’s putting a higher priority on national security than on weak-kneed diplomacy. The inspection regime was virtually nonexistent. Inspectors couldn’t go anywhere at any time. They had to get permission from the IRGC. Then there was a thirty-day waiting time. That isn’t the definition of “far-reaching inspections.” That’s the definition of wimpy inspections agreed to by a weak-kneed American president and his pathetic ‘national security team’.